Renault 3 (R1121). 1961–2 (prod. 2,526; other source lists 2,571). 5-door estate. F/F, 603 cm³ (4 cyl. OHV). 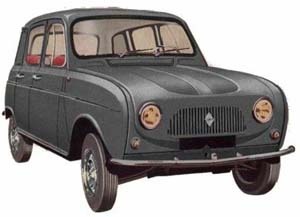 Entry-level Renault based on the 4, but without any luxuries—no hubcaps, interior door trims, third side window, or grille. Engine in the 3CV class in France, but since a Renault 4L cost little more, most customers opted for the better specified car. Rugged and capable, rivalling base 2CVs as intended by Renault.